Thus far during the ODeck Shark Week we've seen the biggest shark, a shark that eats whales and submarines, and the fastest shark. Let's check out some of the deepest - and most odd-looking - sharks. The Frilled Shark, Chlamydoselachus anguineus, is a rare shark that dwells right on the edge between the relative shallows and deep ocean. It can be found on the edge of the continental shelf and down the slope in the Atlantic and Pacific oceans. It has been found as deep as 5,150 feet (1,570 meters), but prefers areas of the continental slope that are more biologically productive. It is eel-like in appearance, with an elongated, slender body, with its fins placed well back. Its head is also like an eel's, and is framed by the fringes of its six pairs of gill slits - this frilled appearance is the source of its common name. Frilled Sharks grow up to about 6.6 feet (2 meters) in total body length, and has an enormous liver relative to body size. The livers of sharks are filled with lipids (fatty materials), which helps them to control their depth. They are one of few species of shark to have an open lateral line, meaning that the sensory receptor cells are placed in grooves that have direct exposure to the surrounding water. Due to the rarity of the Frilled Shark and its preferred habitat away from areas in which humans are likely to be in the water, there have been no known attacks on humans by Frilled Sharks, although researchers have cut themselves on the shark's extremely sharp teeth while examining its remains. Frilled Sharks can open their mouths extremely wide, and have about 300 teeth. The unique configuration of the teeth rows and the angle the teeth sit help the Frilled Shark to grab soft-bodied prey like squid and octopus. It also feeds on bony fishes and smaller sharks. Very little has been observed about its hunting techniques, but researchers have been puzzled about how a shark clearly not built for speed could catch the agile and slippery squid. The theory is that the Frilled Shark curls its body and strikes like a snake, catching the prey by surprise. Indeed, some scientists believe that an ancient, older ancestor of the Frilled Shark may be responsible for the numerous sea serpent legends. The Megamouth Shark, Megachasma pelagios, is the smallest of the large filter-feeding, or planktivorous, sharks. The other two are the Whale Shark and the Basking Shark. It was only discovered in 1976, and since that time it has been sighted or caught only 59 times. Its appearance is so unlike that of other sharks, including the planktivores, that it is currently classified as the only member of its own family Megachasmidae. Like the other filter feeders, the Megamouth Shark swims with its mouth agape, filtering the water for plankton and other small animals, including jellyfish. They grow up to 18 feet (5.5 meters) in body length, and the highest recorded weight is 2,679 pounds (1,215 kg). A tagged male Megamouth Shark yielded data that showed that it spent its days at a depth of around 525 feet (160 meters), and its nights at around 80 feet (25 meters). It is an extremely slow-moving shark, moving at only 1.3 miles per hour (2.1 kmh). 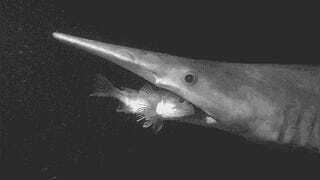 The Goblin Shark, Mitsukurina owstoni, is also a rare, "living fossil" shark. Its skin is pink and can appear quite red when these sharks are removed from the water. They can be found on the upper parts of continental slopes, seamounts, and underwater canyons in all three major oceans, and adults venture deeper than juveniles. Its distinctive long snout is the way it detects the weak electrical signals of nearby prey, because it is covered in the ampullae of Lorenzini. On average, adult Goblin Sharks grow up to about 13 feet (4 meters) in total body length, and for a while that's as big as anyone thought they could be. But in 2000, a female specimen was captured that measured a whopping 20 feet (6.2 meters) long, and the maximum recorded weight of a smaller specimen was 460 pounds (210 kg). Goblin Sharks are not fast swimmers, which means they must hunt by ambush, coming close to prey and then launching its jaws forward to catch the prey. They feed mostly on crustaceans, cephalopods, and teleost fishes. Due to the fact that its pupils do actually change size, vision is probably more important to the Goblin Shark than it is to other deep water sharks, but it is by no means its primary sense. Goblin Sharks are sometimes accidentally caught by deep water fisheries, but the numbers of sharks that are taken are relatively insignificant to the species overall survival. Because it is found in all three major oceans, the IUCN considers it to be a species of Least Concern.